Formulation: Liquid. In PBS, pH 7.2, containing 0.01% sodium azide. 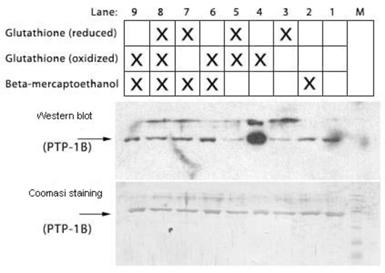 Western blot analysis of Detection of protein-glutathione addicts on Western blot under non-reducing conditions. PTP-1B, phosphotyrosine phosphatase 1B. 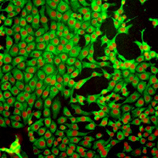 Immunofluorescent analysis of HeLa cells with Glutathione mAb, clone D8, at 1:100 dilution. Red is DAPI nuclear stain.